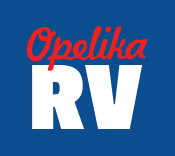 Opelika RV Center has been serving Alabama and Georgia since June of 2000. Full service camper dealership provide rv service, rv body shop, rv parts, new and used rv sales, and rv financing. We are an exclusive KZ RV dealer in our new campers. We carry a full line up of used RV travel trailers , fifth wheels, and motor homes.